Ilayathalapathy Vijay celebrates his 41st birthday today (June 22). He is among the few stars who has a wide fan following across age groups and countries. He has many blockbusters to his credit and has also proven his credentials as an actor in quite a few films. In recent years, Kaththi, Thuppakki and Nanban are among his much-loved films while Thirumalai, Ghilli, Thirupachi and Pokkiri are the other films which shaped him as a mass icon a few years ago. There are very very few who don't enjoy his prowess at dancing and singing, while his agility in the stunt scenes is also applause-worthy. With his upcoming film Puli generating all the hype in the world, the sky is the limit for this beloved star as he aspires to better his own lofty standards with his future films. 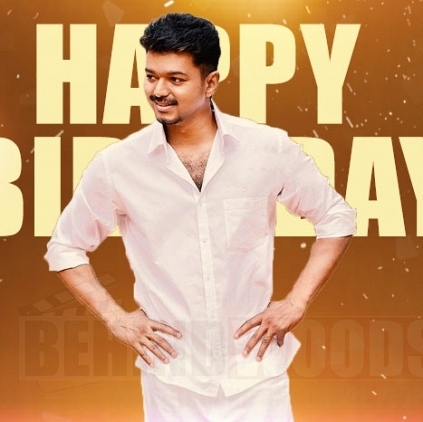 Behindwoods wishes the Ilayathalapathy a very happy birthday and a long and healthy life ahead. 3 more days for another grand Baahubali spectacle ! It’s Amy Jackson for G V Prakash!!! After Vishwaroopam 2, once again for Thoongavanam! Puli First Look To Release On 21st Of June!!! People looking for online information on Happy Birthday Ilayathalapathy Vijay, Happy Birthday Vijay, Puli, Vijay will find this news story useful.